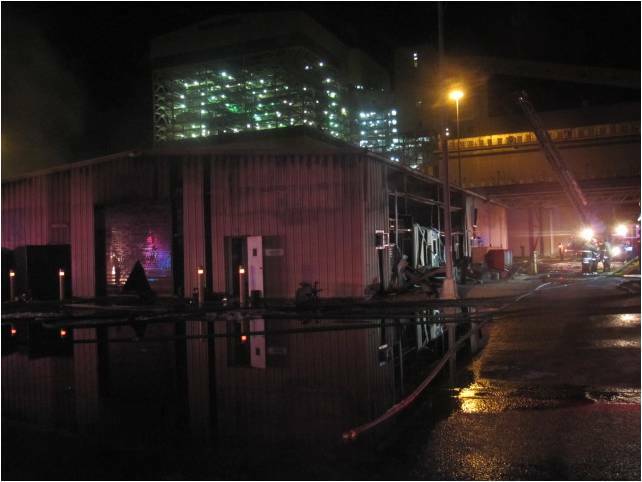 CPS Energy and San Antonio Fire Department officials continue to investigate the cause of a warehouse fire near the JT Deely Power Plant, at Calaveras Power Station, on Calaveras Lake in South Bexar County. The fire, reported at 1:30 a.m. Sunday morning by CPS Energy personnel onsite, totaled the circa 1975, corrugated metal barn. The building will not be rebuilt or replaced; CPS Energy employees and contractor employees will instead be reassigned to other buildings on the property. Officials still do not know the cause of the blaze; some employees reported hearing “popping” noises, which were believed to be the compressed gas in fire extinguishers stored in the building. The warehouse after firefighters had distinguished the blaze early Sunday morning. Located about 50 yards north of the JT Deely Power Plant, one part of the building was used by a contractor responsible for power plant services on the property and the opposite end was used by CPS Energy employees as office space. The warehouse contained cleaning and water treatment chemicals such as denatured alcohol and corrosion inhibitors, among other products. A chemical clean-up was completed Sunday, with follow-up continuing today. The value of the building and its contents is estimated at roughly $500,000.